Learn about symptoms caused by obesity. Learn how obesity is diagnosed. Learn about several obesity treatment options. Learn about obesity follow-up care. Lehigh Valley Health Network (LVHN) offers several surgical and non-surgical treatment options for obesity. If you are wondering whether weight-loss surgery is for you, we invite you to attend one of our regularly scheduled Weight-Loss Surgery Free Information Events. These free events are hosted by one of our weight-loss surgeons and will give you an opportunity to learn about the types of weight-loss surgeries offered at LVHN. You also will learn about non-surgical treatment options, such as medically managed weight-loss programs. Weight-Loss Surgery Information Sessions are free to attend, although registration is requested. Look over your calendar to see which day or evening session works best for you. Want to learn more? Consider attending one of our free, regularly scheduled information sessions or call 610-402-5000 for more information. If you decide weight-loss surgery is not for you, you don’t need to go it alone. Work with our team of weight management specialists at Lehigh Valley Health Network’s (LVHN) Weight Management Center to find a program that is right for you. Our team of weight-loss physicians, certified registered nurse practitioners (CRNP), a patient navigator, registered dietitians, exercise physiologists and behavioral health specialists offers specialized knowledge, tools and techniques tailored to meet your individual needs. In addition, the Weight Management Center team also provides pre- and post-surgery programs for weight-loss surgery patients. Your goals are in sight…you just need to take the first step. The medically managed weight-loss program is led by one of our physicians or a CRNP and is customized according to your goals, lifestyle, current health and nutritional preferences. You may also work with one of our behavioral health specialists or registered dietitians. We provide safe, effective and medically proven options that are tailored to your individual needs. Behavior modification: You will learn new eating habits and how to make positive lifestyle changes to improve your health. Maintenance: You will receive the individual or group support you need to maintain your weight loss after reaching your goal. Weight-loss medications: The use of medications for weight-loss is not appropriate for everyone. We will work together to determine your challenges and help you find the healthiest solution for weight loss. Medications to help weight loss must be used in combination with regular physical activity and a healthy eating program. The use of medications for weight loss is not appropriate for everyone. Over the long term, most obese adults who lose weight will return to their baseline weight if ongoing behavioral strategies aren't used. There are techniques for initiating and maintaining changes in lifestyle that may result in sustained weight loss. Some behavioral strategies include keeping a food journal of what was eaten, where food was eaten, when food was eaten, when hunger occurred and the feelings that were present when eating. A similar activity journal also may be kept. These techniques are useful to analyze eating and activity behaviors, so behaviors that need to be modified can be identified, and strategies for changing those behaviors can be developed. Our behavioral health specialists can help with cognitive techniques that may be used to help change a person's thinking about body image. A reward system, unrelated to food, may be developed to help keep a person on track toward weight-loss goals. Additional behavioral techniques may include serving food from the stove rather than family style and never watching television, reading or doing another activity while eating. Richard Boorse, MD, helps those who have struggled a lifetime to lose weight. Over the past decade, our bariatric surgery team has helped more than 3,000 people lose weight and reclaim their health. Which is just one of the reasons it's been designated a center of excellence by the American Society for Metabolic and Bariatric Surgery. Each year the LVHN bariatric surgery team performs approximately 400 weight-loss surgeries. Over time, we have helped thousands of people reclaim their health by helping them lose weight through weight-loss surgery. We are committed to providing the best possible results for our patients, and we demonstrate that by meeting or exceeding standards set by the Metabolic and Bariatric Surgery Accreditation and Quality Improvement Program (MBSAQIP), a joint program of the American College of Surgeons and the American Society for Metabolic and Bariatric Surgery. Lehigh Valley Hospital–Cedar Crest has earned designation from the MSASQIP as a fully accredited, comprehensive center. Weight-loss surgery, also called bariatric surgery, is a major procedure. It changes the way your body digests food. Weight-loss surgery may be appropriate if you have tried other methods to lose weight but remain severely obese, or if you have a serious disease caused or made worse by obesity. It may be appropriate for people with a BMI of 40 or greater, or about 100 pounds overweight for men and 80 pounds for women, or for people with a BMI of 35 or greater if they have serious medical conditions such as type 2 diabetes, hypertension and sleep apnea, to name a few. As you learn about weight-loss surgery procedures, you will hear the terms “restriction” and “malabsorption.” These terms describe how weight-loss surgery creates weight loss. Restriction reduces the size of the stomach. This reduction is done either by surgically reducing the size of the stomach (such as with gastric bypass or gastric sleeve) or by using a device such as a gastric band. Because the stomach space is smaller, you will feel full quickly and eat less food. Malabsorption limits the absorption of calories and nutrients. 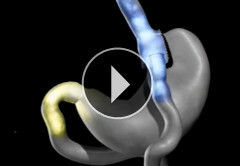 Gastric bypass surgery bypasses a portion of the small intestine, causing an effect called malabsorption. When part of the small intestine is bypassed, it means fewer calories and nutrients are absorbed by the body, resulting in weight loss. This also means necessary vitamins and minerals are not absorbed. If you have gastric bypass surgery, you will need to take specific vitamin and mineral supplements, as explained by your physician. LVHN offers three types of weight loss surgery. Bariatric surgery procedures result in weight loss between 50 and 80 percent of excess body weight. Remisson of type 2 diabetes occurs in more than 70 percent of patients after Roux-en-Y gastric bypass and also is experienced by patients with gastric sleeve. Other obesity-related comorbidities are greatly reduced, such as high blood pressure, high cholesterol and obstructive sleep apnea. These five steps will help you prepare in the three to six months before your surgery date. 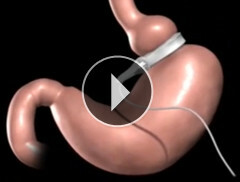 Adjustable gastric banding is performed laparoscopically through small incisions. Your surgeon will place a silicone band around the top portion of the stomach, leaving a smaller pouch available for food. The small pouch means you will feel full after eating only small amounts of food, helping you lose weight. The band’s volume can be adjusted to regulate the amount of food restriction. If necessary, the procedure can be reversed. Our board-certified surgeons have performed more than 1,100 gastric bypass surgeries since our program began. During laparoscopic gastric bypass surgery, your surgeon will reform your stomach to create a smaller stomach pouch. A section of the small intestine will attach directly to the pouch. This allows food to bypass a portion of the small intestine that absorbs calories and nutrients. You will feel fuller sooner and eat less because your stomach pouch holds less food. Gastric bypass also may effectively treat acid reflux disorder because the acid-producing part of the stomach is separated from the esophagus. 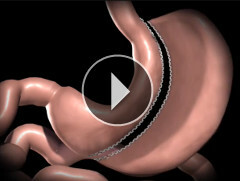 The gastric sleeve procedure removes about 75 percent of your stomach through laparoscopic surgery. What remains is a narrow tube (or sleeve) of stomach. This limits the amount of food you can eat and helps you feel full sooner. It also allows for normal digestion and absorption, so you get the nutrients and vitamins you need. During the procedure, the part of your stomach that curves outward, called the fundus, will be removed. The fundus contains most of the glands in your stomach that secrete an appetite-stimulating hormone called ghrelin. Because ghrelin may be partly responsible for making you feel hungry, removing this part of your stomach may help you lose weight afterward. Before you head out on a long trip, you take time to prepare. Here is help for how to determine whether your health insurance plan covers weight-loss surgery. During the preparation phase, our multidisciplinary team will prepare you for surgery and your life after surgery, especially the physical and emotional adjustments that come with such profound transformation. Through individual and group meetings, we will help you discover new eating and exercise habits and explore other aspects of the new lifestyle you’re adopting. You also will learn how your particular surgery will impact your short- and long-term weight-loss results.That same philosophy holds true with weight-loss surgery. Preparation in the months before your surgery will lay the groundwork for your success after surgery. This preparation will include exams and tests to ensure you are a good candidate for surgery as well as determining your insurance coverage and taking part in a three-month or six-month weight-loss surgery preparation program. Please note that the length of time required for pre-surgery preparation is often determined by your insurance, which is why we provide three-month (90-day) and six-month (180-day) programs. Learn how to make positive changes to your diet and to your approach to meal planning. Take steps to improve your physical fitness. Understand the emotional and environmental triggers that may influence eating habits. Quit smoking or using tobacco products. Smoking and the use of other tobacco products can interfere with your successful weight loss as well as your overall health. If you smoke or use other tobacco products, we recommend enrolling in LVHN’s private and confidential Tobacco Treatment Program. This supportive quit-smoking program offers over-the-phone and face-to-face counseling services provided by certified tobacco addiction specialists. Surgical candidates need to demonstrate they are tobacco-free before receiving approval for surgery. Your weight-loss surgeon will make sure you are a good candidate for surgery, and you also should also discuss weight-loss surgery with your primary care provider. It is not unusual to have an office visit, blood work to test for nutritional deficiencies and other problems, and an EKG to make sure you have no pre-existing problems. You also may need to complete other health tests – a stress test for your heart or a sleep study, for example – if you have other health risks. You'll want to check with your health insurance provider to make sure the procedure is covered. Let your doctor know about any prescription or over-the-counter drugs, vitamins or herbs you are taking. In the week before surgery you may be asked to stop taking aspirin, ibuprofen (Advil, Motrin), vitamin E, warfarin (Coumadin) and any other blood-thinning drugs. Ask what drugs you can take on the day of your surgery. Surgery isn't recommended for people who are abusing drugs or alcohol, who may have other serious medical problems or who are not willing to make a commitment to life-long diet and exercise programs. If you're a tobacco user, you must quit before surgery and should not start again. Beyond the support your LVHN team offers, group meetings will connect you with other participants in the pre-surgery stage. Meetings cover topics like pre- and post-surgery nutrition; the importance of physical activity; how stress can impact the way you eat; and overall lifestyle management. These meetings also provide a place where you can share ideas, ask questions, learn from our facilitators and other participants in the group, and build friendships and relationships with people pursuing the same goals. Before surgery you will need to have a complete physical exam to make sure you are healthy enough to have the procedure. You also should receive nutritional and mental-health counseling to make sure you are prepared for what to expect after surgery. There may be other risks, depending upon your specific medical condition. Be sure to discuss any concerns with your doctor before the procedure.